Jimmy Fallon knows how to get into the spirit of Memorial Day. 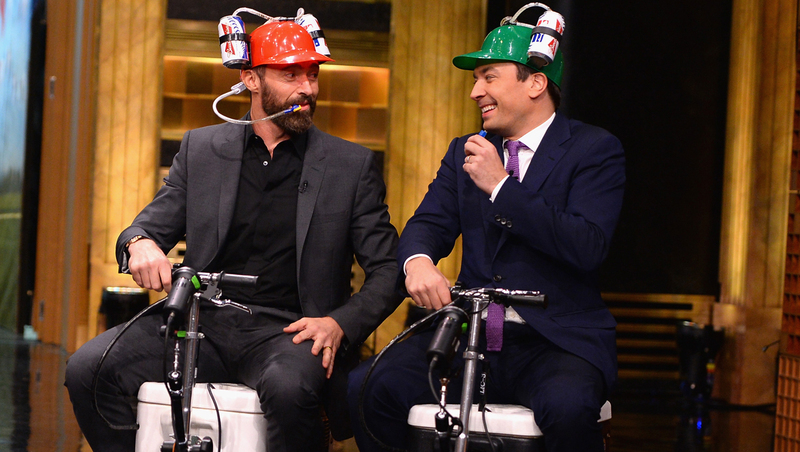 In honor of the upcoming holiday weekend, the "Tonight Show" host challenged guest Hugh Jackman to an unusual sporting event. "What's more American than beating an Australian at a good old fashioned beer cooler scooter race?" Fallon asked his audience on Wednesday. The late-night funnyman and the "X-Men: Days of Future Past" star then proceeded to race each other while chugging beer and riding coolers through Fallon's NBC set in New York. They had many obstacles to face along the way, all of them themed around Memorial Day weekend. A baton twirler, an old man contemplating crossing the street, a little boy who ate too much candy and a dad flipping burgers on a grill were just some of the hurdles on the path. "The Tonight Show with Jimmy Fallon" airs weekdays at 11:35 p.m. ET on NBC. "X-Men: Days of Future Past" flies into theaters on Friday.